Which has a higher alcohol content—red or white wine? 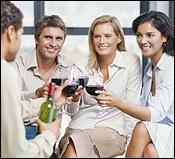 In general, red wines have higher alcohol content than white wines, but it varies from wine to wine. Remember that alcohol directly correlates to the ripeness (i.e., sugar content) of grapes. As grapes ferment, the sugar converts to alcohol. Red wines tend to be picked at a higher ripeness (more sugar) than white wines, which is a combination of both winemaking style and the physiology of the grape. If you're ever curious about a wine's alcohol content, check out the percentage of alcohol by volume, which is always listed on the label. That's the law in the U.S.—although the number is a bit of a guesstimate. The regulations allow for as much as 1.5% leeway in either direction, so a label could say 12% alcohol if the wine were actually as much as 13.5% or as little as 10.5%.